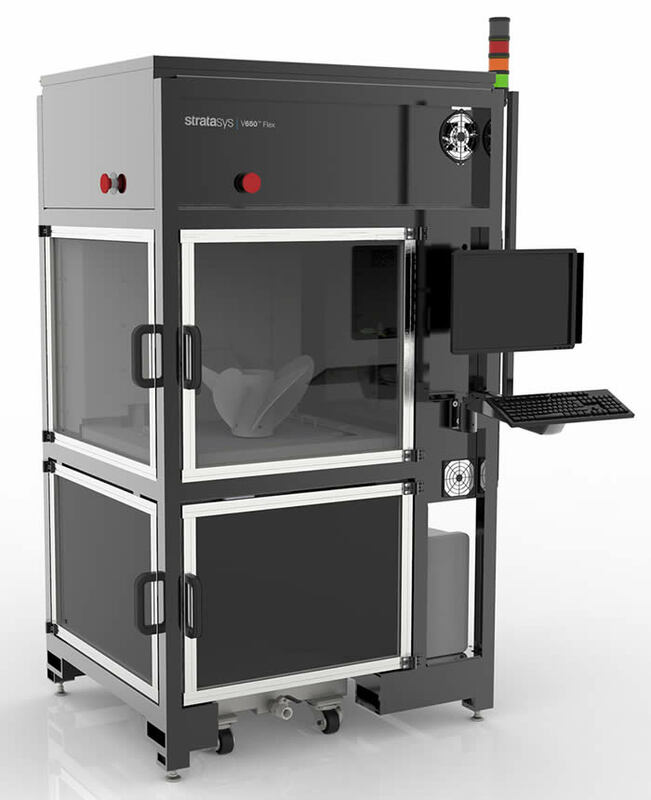 With the Stratasys V650 Flex Stereolithography 3D printer and you will have game-changing advances in speed, accuracy and reliability to the established capabilities of Stereolithography. Create smooth-surfaced prototypes, master patterns, large concept models and investment casting patterns more quickly and more precisely than ever before. The V650 Flex’s adjustable beam spot sizes - 0.005” to 0.015” - enhance control, detail, smoothness and accuracy. In partnership with DSM, Stratasys have configured, pre-qualified and fine-tuned a four-strong range of resins specifically to maximize the productivity, reliability and efficiency of the V650 Flex 3D printer. You have twice the capacity and, to ease workflow further, this production-based machine provides a large VAT for maximum output (build volume 20”W x 20”D x 23”H) and interchangeable VATs. For applications needing strong, stiff, high-heat-resistant composites. Great detail resolution. Readily combine a configurable environment with the power of a large-scale industrial size system to fine-tune materials and produce perfect outputs. You are also equipped with twice as many scanning systems, in a footprint smaller than the nearest competitor can offer. With the Stratasys V650 Flex, you can confidently upscale your thinking. The Stratasys V650 Flex prints through short power outages, and if you ever need to re-start, you can pick up exactly where you left off. Years of testing have helped deliver not only the stamina to run and run, but also low maintenance needs and high efficiency. To make life even easier, the V650 Flex runs on 110V power – no need to switch to a 220V power source. Every Stratasys V650 Flex is equipped with a user-friendly, touch-enabled interface developed in parallel with SolidView build preparation software. There are smart power controls and Adaptive Power Mode for automated adjustment of laser power, beam size and scan speeds for optimum build performance. Work with advanced efficiency. Materials, Technologies, and 3D Printers: Learn how to Make the Right Choice for your Business and Use Case. Is the Stratasys V650 Flex right for you?